Vinegar & Water Melting Ice Trick - Does it work? Vinegar and Water Melting Ice Trick – Does it work? Have you heard about the vinegar and water melting ice trick? Does it really work? For many of us here in the U.S. there is a lot of snow. That means that, more often than not, when you go outside in the morning, your car will be covered in snow and ice. Wouldn’t it be nice if there was something easy that would make melting ice on your windscreen and car windows? There is a meme currently running the rounds on Pinterest that says that vinegar and water mixed 2/3 to 1/3 if effective in melting ice so you don’t have to scrape. But does the vinegar and water ice melting trick really work? Does this Melting Ice Trick really work? Well…not quite in the way that the photo might indicate. 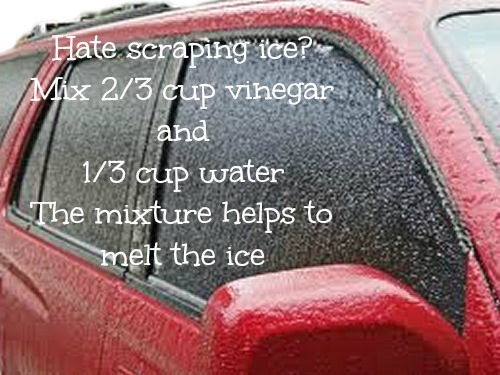 Sadly, there is no cure all for ice scraping with a single spray of the mixture. However, the process is based in some fact. To get it to work properly, when you are expecting ice in the morning, spray your windows with the mixture the night before. Then, the following morning, the windows should be clear of the icy mess. How does it work? Vinegarcontains acetic acid, which lowers the melting point of water – preventing water from freezing. 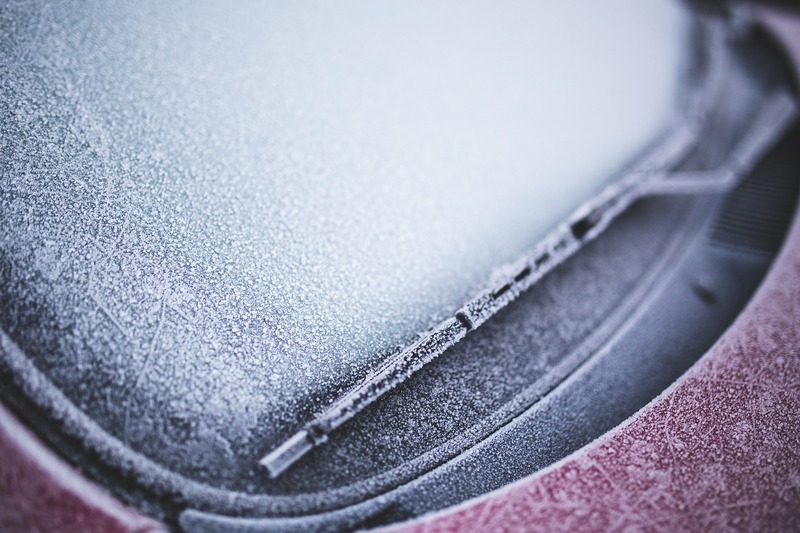 If you come out in the morning to a frozen car window and then spray the mixture on it, it might help to loosen the ice slightly but by then you could have scraped it all clean anyway. While the trick above doesn’t have great success, there are some ways that do work. The fastest, safest, and most reliable way, to get rid of the ice is the old fashioned way. Start the car, turn on the heat and blast it at the windows, then WAIT and scrape. There really is no substitute for the tried and true ways that we have been practicing for generations.. The heat works for melting ice and the gold old elbow grease gets rid of it all. When you start your car a bit before you want to use it, the car will heat up and the fan will also heat the windshield, melting the ice. Keep a bottle filled with 2 parts of rubbing alcohol and one part tap water. Store it in a room that is at room temperature. The temperature of the mixture causes some of the ice to thaw. As the heat transfers from this melted area, the unbroken ice nearby will also start to me. 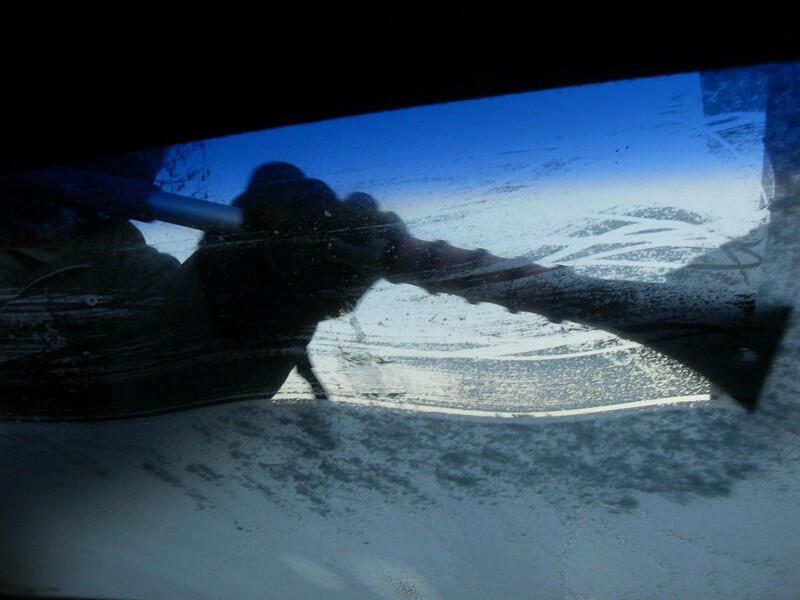 There are many commercial products that are made to melt the ice on windshields. We all know about using salt on frozen sidewalks. The same principle holds for saltwater solutions and windshield ice. Road salt works best. although table salt will work in a pinch. This takes some forward planning but is very effective if you are expecting a light snowfall. Cover the windshield with something light such as a sheet, or towel and weigh it down so that ice won’t build up. Soak the cover with a salt water solution and place it over night. NOTE: if you are expecting a lot of snow, don’t use this method. The covering will be very heavy and hard to remove the next day. It’s a good idea to keep an ice scraper in your car all the time if you live in an area with many freezing temperatures. You never know when you will need it! Thanks for the comment. I did have the wording that temps needed to be above freezing but have added a bit more to make it more clear. I say three is no substitute for starting the engine and blasting the heat. But like you said, scraping is faster.